Beggars All: Reformation And Apologetics: Did Luther Believe Faith is the Gift of God? Did Luther Believe Faith is the Gift of God? "Another thing... about Luther's idea of faith that I learned from listening to a Scott Hahn interview. His idea of faith is that it comes from oneself, that we bring our own faith to the table and God justifies us based on that." He explained this Hahn interview was something purchased from Catholic Answers entitled, "Faith Alone Is it Justifiable." I did a quick search of Catholic Answers and came up with nothing. It appears to be a three-part interview from July 1998 no longer offered. Even though I wasn't able to track down the Hahn interview, the person making the assertion on Luther-according-to-Hahn was kind enough to actually transcribe the section from the Scott Hahn interview in question (part one, part two). The Lutheran view of faith alone is that the word ‘sola’ or 'alone' is an adjective that modifies the word faith, so that you are justified by faith and faith by itself. The Calvinists view of 'alone' is different. Sola fide for the Calvinists is an adverb that modifies the word ‘justify’. So the Calvinist would say you are not justified by a faith that is alone rather you are only justified by faith... For the Lutherans our faith is what justifies us but our faith is what we ourselves contribute on our own power. The Calvinist say, oh no, you can't generate on your own a faith that would justify. God has to regenerate you first. He has to send his Spirit down to you. He has to recreate you in order for you to exercise any faith that would possibly justify you. The Lutheran would say, oh no, you can't say that God has to regenerate you or recreate you in order for you to exercise any faith that God would justify you with because once you say that that you've allowed the Catholic position back in through the back door. Because what you are in effect saying is that God only justifies the person he transforms and makes righteous and godly. So the Lutherans accused the Calvinists of kicking out the front door what they are bringing back through the back door. I have to admit never having studied the differences on "faith alone" between Lutherans and Calvinists that Hahn refers to. If such a controversy between the two traditions has played out, I don't recall reading about it. I will say this though, as far as I understand historic Lutheranism via my Reformed sources, regeneration is monergistic ("On the whole the Lutherans maintain, in opposition to Rome, the monergistic character of regeneration. They regard man as entirely passive in regeneration and incapable of contributing anything to it, though adults can resist it for a long time" (Louis Berkhoff, Systematic Theology, p. 477). The phrase "gift of faith" is peppered throughout Luther's writings. It certainly isn't given the emphasis later Reformed writers would give it. Calvin's writings are a bit similar, provoking some to question whether or not Calvin believed faith was God's gift. Here are a few specific instances from Luther on the gift of faith. The first is an implicit example from Luther's Small Catechism. In regard to the regenerating work of the Holy Spirit, Question 161 asks, "Why do you say that the Holy Spirit has done this by the Gospel?" Answer: "The Gospel is the means by which the Holy Spirit offers us all the blessings of Christ and creates faith in us." Question 162 asks, "Besides faith, what else does the Holy Spirit create in you by the Gospel?" Answer: The Holy Spirit sanctifies me in the true faith, that is, by faith He works renewal of my whole life- in spirit, will, attitude, and desire- so that I now strive to overcome sin and do good works (sanctification in the narrow sense). The second type of first birth is faith which we attribute to God. It is the chief constituent of the whole Christian nature. Faith puts to death the old man. It makes new children which henceforth bring thoughts and goals in accordance with God's. This first birth is God's blessing and His own work. No one should take it upon himself, that is no one should understand faith as coming out of his own powers as many do. When they hear of faith they consider it as something they receive by an act of their own will. In this way they credit themselves with what alone belongs to God since it is purely a divine work to have true faith. As Saint Paul says to the Ephesians [Ephesians 2], 'By grace you have been saved through faith, and that not of yourselves. It is God's gift, not of works, so that no one can boast [The Festival Sermons of Martin Luther (Michigan: Mark V Publications, 2005), p. 238]. I don't have any notion to turn Luther into a Calvinist. If there are differences as to what Luther meant by faith being God's gift as opposed to what the Reformed tradition holds, I don't recall reading anything on this, and would welcome any tips on relevant sources. 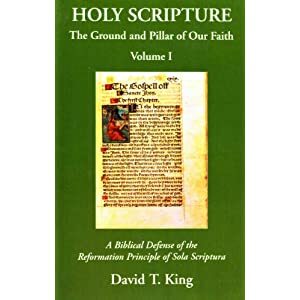 If there are differences between what Luther held as compared to subsequent Lutheranism, I'm not knowledgeable in that area, and likewise would welcome any pertinent materials. I would assume Scott Hahn wasn't making up his exposition on the differences between Lutherans and Calvinists on the nature of faith. It smells of some sort of 19th or early 20th century technical dispute. Likewise, I'd be interested in seeing any supporting information on Hahn's comments. I can't see how Hahn is correct when he states, "For the Lutherans our faith is what justifies us but our faith is what we ourselves contribute on our own power." There are a few possibilities. Perhaps he simply mis-spoke during the interview. Perhaps he clarified what he meant later. Perhaps the transcription is inaccurate. Or, perhaps he's referring to a technical dispute that I'm not aware of, or maybe... he's just wrong. Not sure how Reformed view it, but the Lutheran view is that faith is a gift of God and that faith comes in Baptism (Acts 2:38)...and through the hearing of God's Word...when and where He wills. Oops. I meant 'The Holy Spirit' is given in Baptism...and that faith comes by hearing. When faith comes...then Baptism is complete. but it has been my understanding that Reformed Christians wouldn't say things like "the spirit is received through faith". Wouldn't the Reformed tend to say that faith is created by the spirit? Your question sounds to me like an ordo salutis issue. I hear you saying that for Lutherans, the Spirit produces faith, and then the Spirit is received through faith. If I've correctly stated what you're saying, you then put forth the following in regard to the Reformed: Faith is created by the Holy Spirit, the Holy Spirit is not received through faith. Am I following you here? As I did a cursory search of the boc, baptism (a visible sign of God's Word)"grants eternal salvation to all who believe." While I might not agree fully with it, I can understand how Lutherans say baptism is another form of the Word of God, and thus has a powerful ability. Faith is a response to God's Word. If one is baptized with faith present, they have received one of the promises that Christ will be their savior. It is His promise to us that he will save those with faith. The Word of God connected with water makes that water a powerful visible sign of God's Word. I get this. The question I would have for my Lutheran friends is the following: are all who are baptized given the ability to believe, or the gift of faith? I would have no problem in understanding Lutherans to believe that indeed, certain children have faith present in their baptism (prooftext: John the Baptist kicking in the womb). But if all who are baptized receive the gift of faith in a monergistic way, I would expect to find that all who have been given such a gift of faith through baptism should persevere to the end, or, for the sake of argument, have a living faith at some point in their life, even if it is lost some time along the way. The baptism issue is one of the reasons I'm not a Lutheran. While I might not agree with Lutheranism, I'd at least like to understand it better. I have no desire to caricature Lutheranism. i would suggest you find a local confessional orthodox lutheran church and take the Bible information classes generally used for prospective members or people, like yourself, who want to know more about lutheranism..they are generally offered regularly and i'm sure the pastor would be thrilled to swim the deep waters with you. and in case you're not aware of this internet resource, i've posted a link to rev fisk and his video blog dealing with all things lutheran. Thanks for the suggestions and link, but I'd rather just have a few simple answers to my questions, posted here. I'm not looking for any sort of debate. This is simply a fact finding encounter of what the current Lutheran position is. From what I read, Luther believe that salvation is entirely God's responsibilty and damnation is entirely man's responsibility. This assertion is of course seen as "illogical" by many like the doctrine of the Trinity but is upheld. Luther's advice is not to try to enquire into this mystery of the Divine majesty. The Reformed will probbaly disagree on this assertion. We are told that the forgiveness of sins and the Holy Spirit are given in baptism (Acts 2:38). When a faith comes wherein the baptized confess faith in Christ, then baptism is complete. We do believe that people can and do walk away from their baptisms. I do. But the Lord leads us to repentance, and returns us, once again to our baptism. Is there a point where the Lord will let a baptized person go...forever? I think that's a question that we cannot answer, but it certainly is possible. "But if all who are baptized receive the gift of faith in a monergistic way, I would expect to find that all who have been given such a gift of faith through baptism should persevere to the end, or, for the sake of argument, have a living faith at some point in their life, even if it is lost some time along the way." I would say that makes sense. We should expect that. We all sin and fall away, but do some *ultimately* fall away? If some do it is their own choice. That possibility cannot affect the assurance that Christians have that God will save them, because their assurance of salvation is concrete and unmistakable and they can rest assured that God certainly will not disappoint them. Please explain this sentence. Thanks. your answers are plainly answered by rev fisk in a much better way than i ever could.. my pointing you to that link was kind of like ordering take out from a fancy restaurant for visitors in my home since i can't cook very well..i love to cook, but you won't be satisfied..
i would think that someone looking for a better understanding of lutheran beliefs regarding baptismal regeneration would take the word of a lutheran and follow the link to that information given in a super clear, concise, and theological manner which he (you) would appreciate. Paul assured the Galatians, “All of you who were baptized into Christ have clothed yourselves with Christ” (Gal 3:27). In and through baptism a most intimate link between the sinner and the Savior is promised and assumed. Other New Testament passages affirm that the gift of the Holy Spirit, forgiveness of sins, and salvation are bestowed through baptism. They are not just symbolized or pictured in baptism; baptism is said to give these blessings. Perhaps because of such vigorous promises, people speak of baptism “guaranteeing” salvation. But more needs to be said. If the baptized sinner retains saving faith, he or she will retain the gift of salvation and inherit heaven. But this is different than saying baptism guarantees heaven. Baptism is God’s way of beginning or enriching a lifelong relationship, but it remains vital that the faith given be nurtured and strengthened through the gospel aside from baptism. This is why, when children are baptized, we normally urge parents and others to include the children in family devotions, train them to read Scripture at home as well as participate in public worship and Sunday school. It is important that all who are baptized enjoy growth in faith and Christian lifestyle to maintain their hold on God’s salvation promises. If the saving faith received through baptism is allowed to die, the result is a personal forfeiting of spiritual and eternal life. It is irresponsible to speak of baptism “guaranteeing” salvation unless this kind of clarification is immediately added. God has chosen to give and preserve faith through instruments that accompany baptism, namely the Bible and the Lord’s Supper. To despise these is more like guaranteeing eternal death, not life. Since the Bible draws the striking parallel between baptism and Old Testament circumcision (see Colossians 2:11-12) we may draw a fitting analogy. Any Old Testament Jew who thought that his being circumcised was a “guarantee” of eternal blessing was very wrong. Paul explains: “A man is not a Jew if he is only one outwardly, nor is circumcision merely outward and physical. No, a man is a Jew if he is one inwardly; and circumcision is circumcision of the heart, by the Spirit, not by the written code” (Romans 2:28-29a). This is not a despising or a denial of the blessings received through circumcision. But it is a strong reminder that unbelief forfeits all blessings once received through the God-given external rite with its internal promises. Similarly, a baptized person is not to be considered a believer if he was once baptized but has neglected the gospel ever since. To think that baptism guarantees the preserving of faith for a lifetime is unwise presumption involving a misunderstanding of how the Spirit works. The Spirit gives saving faith, as he does with infants through baptism, and then preserves faith, through Word and sacrament, until we depart this life at death. We are commanded to seek and rejoice in both aspects of his gracious work. We desperately need both. We praise him for giving us both.